Cold weather and icy roads do not deter everyone from running and exercising outside, as it should not. Utilizing safe outdoor practices and wearing proper clothing will keep you running all year round. As with all activities when you are exercising in the cold, you want to ensure that most importantly you are wearing the appropriate clothing. While staying warm when exercising is important, it is also key not to bundle up too much. One common mistake novices to cold weather workouts do is dress too warm. Exercise warms the body and causes you to sweat. If you are sweating in cold weather, you will lose a significant amount of heat, thus making you feel chilled. If you dress in layers then you are able to remove layers as soon as you start to sweat and put them back on as needed. Start with a thin layer of synthetic material that will draw (or "wick") sweat away from your body first. Then, add a layer of fleece or wool for insulation. And lastly, top this warm layer with a waterproof, breathable outer layer that will break the wind. Always avoid cotton, as cotton is not good at wicking sweat away from the body and will feel cold and wet up against your skin. Everyone has different needs regarding the amount of insulation worn for all outdoor activities. You will need to try out different combinations of layering with each activity until you get the right combination that works for you. With your body covered, you don’t want to forget about your head, neck, hands, and feet. When it is cold outside your blood flow becomes concentrated to your body’s core and to the larger muscle groups in the extremities that are being used. This leaves your hands, ears, face and feet vulnerable to frostbite. You want to make sure that you wear thin moisture-wicking gloves under a pair of thicker wool mittens or gloves. Keep your face covered with a scarf or mask to shield it from the cold and wind. Depending on how cold it is, you may choose a hat (that includes coverage over your ears) or a headband by itself to keep your ears shielded from the elements. You may also need to wear thicker than normal socks or layers of socks to keep your feet and toes warm. Now you have all of your cold weather gear on and you are ready to go, right? Well not exactly. There are some other key items to keep in mind to ensure that you stay safe while exercising out in the cold. Before heading out, check the forecast for the time frame that you plan on being outside. Temperature, wind, moisture (snow or rain), along with the length of time that you will be outside, are all key considerations in planning a safe cold-weather workout. If there is a Polar Vortex headed our direction, it would definitely be a good idea to avoid exercising outside that day. Individuals with asthma, Raynaud’s Disease, and heart conditions should remain cautious and consult with a doctor before attempting an outdoor exercise routine in the winter. Knowing the signs of frostbite and hypothermia are important to know so that you can deal with it should a problem arise. Frostbite occurs when skin and underlying tissues freeze. Some warning signs include discoloration, numbness or loss of feeling in a body part or even a stinging/prickling sensation. The most common areas affected are the fingers, toes, nose, ears, cheeks and chin. If you are sensing that you may be getting frostbite, you want to get out of the cold as quickly as possible and start to slowly warm the affected areas. You do not want to rub your the affected area of your skin as that may cause damage. If you continue to experience numbness after attempts to warm your skin you may need to seek medical attention. Hypothermia is when your body temperature drops below 95° F. Some signs are shivering, goose bumps, confusion, numbness, lack of coordination, sluggishness, difficulty speaking, mental confusion, stumbling, muscle stiffness, slurred speech, trouble seeing and loss of consciousness. If you experience any of these symptoms, you should seek emergency medical help and if possible, move to a warm, dry place and attempt to warm yourself with extra clothes and blankets. With the daylight hours being shorter, you are more likely to be running in the dark. Be sure to wear reflective, fluorescent gear and use a headlamp so you can see where you are going. Make sure you engage in a warm-up routine prior to avoid injury. You do not want to be out in the cold with stiff, cold muscles. Make sure you run in an area that allows you to keep some stable footing (i.e. not an icy path). 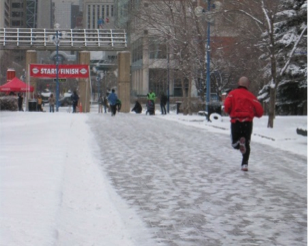 If the roads are icy and snowy and this is your only place to run, make sure that you are wearing shoes with good traction. It is more important that you avoid slipping and falling when running, therefore you may have to sacrifice speed for greater stability with your footing. These tips can help you enjoy your winter running routine with greater safety, but as always pay attention to how your body feels. Our bodies react differently in varying climates and altitudes. You may need to adjust the intensity or duration of your workout. And always make sure to let someone know when you leave and when you expect to return in case something does happen while you are out. Another option to improve safety and increase your fun quotient is to take a buddy with you. If you would like information from our clinic regarding our customized sports performance packages that we offer or if you need to be evaluated following a winter sports injury you recently sustained, please call us at (630) 230-9565 or email us at info@dptsport.com. DPT Sport is the premier physical therapy and wellness clinic in the Burr Ridge/Hinsdale area, offering evidence-based physical therapy and post-surgical rehabilitation as well as a multitude of customized wellness and injury prevention programs.